In stock -This product will ship today if ordered within the next 11 minutes. 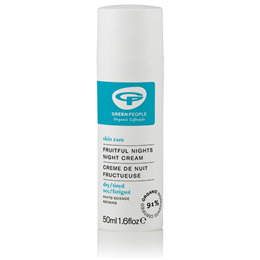 Below are reviews of Green People Fruitful Nights Night Cream - 50ml by bodykind customers. If you have tried this product we'd love to hear what you think so please leave a review. This is a lovely non greasy night cream that absorbs well into the skin, my skin is so much softer and healthier looking. After being in the outside elements all day its good to feed my skin with a cream that's full of goodness. Nice textured cream with fruity fragrance. Glides onto skin without leaving a greasy residue. Results were good, skin noticeably brighter and softer after only a couple of uses.